I A D O R E J A P A N ! ! ! Lovely shade of pink and the lace detailing on your cami is so pretty! you look amazing girl!!!!! love it all! Nice outfit, I love your sunnies and sandals! What a beautiful outfit! That hat is so pretty. This outfit is fantastic! Black and white combo is my favorite and with pink hat it looks great! I invite you to a giveaway on my blog where you can win a comfy cardigan. nice look,the top looks like the suit with that skirt! sei bellissima, adoro la gonna!!! Me encanta! La falda con ese vuelo es preciosa, me gustan especialmente el bolso y las gafas... Muy guapa! Love that skirt, it's perfect! Also, that pink hat is so pretty! Love this outfit! Especially the shoes and hat!! Greaat style! 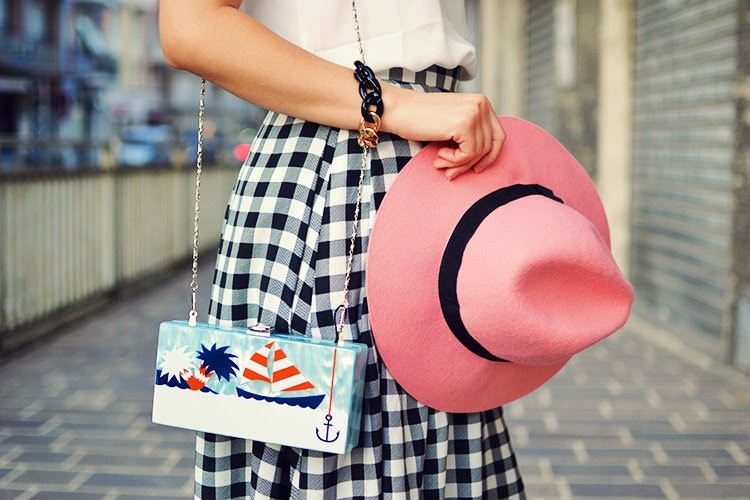 I love the pink hat with this black and white outfit! love the skirt but also that top is to die for!